The forge or smithy is the workplace of a smith or a blacksmith. Forging is the term for shaping metal by plastic deformation. Cold forging is done at low temperatures, while conventional forging is done at high temperatures, which makes metal easier to shape and less likely to fracture. A basic smithy contains a forge, sometimes called a hearth for heating the metals, commonly iron or steel to a temperature where the metal becomes malleable (typically red hot), or to a temperature where work hardening ceases to accumulate, an anvil to lay the metal pieces on while hammering, and a slack tub to rapidly cool, and thus harden, forged metal pieces in. Tools include tongs to hold the hot metal, and hammers to strike the hot metal. Once the final shape has been forged, iron and steel in particular often get some type of heat treatment. This can result in various degrees of hardening or softening depending on the details of the treatment. Some of the earliest forges were just pits with coal in them. With time they developed different techniques to make the metal hotter and more pliable. Today, forges are still used, but with the modern advances of this technology, we find more automation. Some forges are almost completely automated. In the future, forges might be completely automated even to the extent of having robots do the most dangerous operations. Forging is the working of metal by plastic deformation. It is distinguished from machining, the shaping of metal by removing material, such as by drilling, sawing, milling, turning or grinding, and from casting, wherein metal in its molten state is poured into a mold, whose form it retains on solidifying. The processes of raising, sinking, rolling, swaging,drawing and upsetting are essentially forging operations although they are not commonly so called because of the special techniques and tooling they require. Forging results in metal that is stronger than cast or machined metal parts. This is because during forging the metal's grain flow changes in to the shape of the part, making it stronger. Some modern parts require a specific grain flow to ensure the strength and reliability of the part. 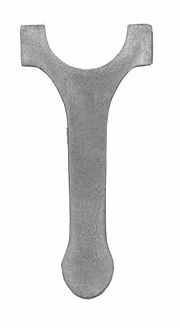 Scan of sectioned, forged connecting rod that has been etched to show grain flow. Many metals are forged cold, but iron and its alloys are almost always forged hot. This is for two reasons: first, if work hardening were allowed to progress, hard materials such as iron and steel would become extremely difficult to work with; secondly, most steel alloys can be hardened by heat treatments, such as by the formation of martensite, rather than cold forging. Alloys that are amenable to precipitation hardening, such as most structural alloys of aluminium and titanium, can also be forged hot, then made strong once they achieve their final shape. Other materials must be strengthened by the forging process itself. Forging was done historically by a smith using hammer and anvil, and though the use of water power in the production and working of iron dates to the twelfth century C.E., the hammer and anvil are not obsolete. The smithy has evolved over centuries to the forge shop with engineered processes, production equipment, tooling, raw materials and products to meet the demands of modern industry. In modern times, industrial forging is done either with presses or with hammers powered by compressed air, electricity, hydraulics or steam. These hammers are large, having reciprocating weights in the thousands of pounds. Smaller power hammers, 500 pounds or less reciprocating weight, and hydraulic presses are common in art smithies as well. Steam hammers are becoming obsolete. In industry a distinction is made between open- and closed-die forging. In open-die work the metal is free to move except where contacted by the hammer, anvil, or other (often hand-held) tooling. In closed-die work the material is placed in a die resembling a mold, which it is forced to fill by the application of pressure. Many common objects, like wrenches and crankshafts, are produced by closed-die forging, which is well suited to mass production. Open-die forging lends itself to short runs and is appropriate for art smithing and custom work. Closed-die forging is more expensive for mass production than is casting, but produces a much stronger part, and is used for tools, high strength machine parts and the like. Forgings are commonly used in automotive applications, where high strength is demanded, with a constraint on the mass of the part (high strength-to-mass ratio). Forged parts are more suitable for mass production. The process of forging a part becomes cheaper with higher volumes. For these reasons forgings are used in the automotive industry, usually after some machining. One particular variant, drop forging, is often used to mass produce flat wrenches and other household tools. A forge which typically uses bituminous coal, industrial coke or charcoal as the fuel to heat metal. The designs of these forges have varied over time, but whether the fuel is coal, coke or charcoal the basic design has remained the same. The illustration at the beginning of this article shows a coal forge in operation. A forge of this type is essentially a hearth or fireplace designed to allow a fire to be controlled such that metal introduced to the fire may be brought to a malleable state or to bring about other metallurgical effects (hardening, annealing, and drawing temper as examples). The forge fire in this type of forge is controlled in three ways: 1) amount of air, 2) volume of fuel, and 3) shape of the fuel/fire. Firepot or hearth—a place where the burning fuel can be contained over or against the tuyere opening. In practice, fuel is placed in or on the hearth and ignited. The bellows are worked to introduce additional air (oxygen) into the fire through the tuyere. With additional oxygen, the fire consumes more fuel and burns hotter. 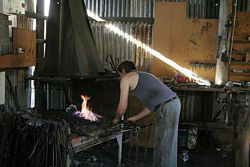 A blacksmith balances the fuel and oxygen in the fire to suit particular kinds of work. Often this involves adjusting and maintaining the shape of the fire. If a larger fire is necessary, the smith increases the air flowing into the fire as well as feed and deepen the coke heart. The smith can also adjust the length and width of the fire in such a forge to accommodate different shapes of work. A forge typically uses propane or natural gas as the fuel. One common, efficient design uses a cylindrical forge chamber and a burner tube mounted at a right angle to the body. The chamber is typically lined with refractory materials, preferably a hard castable refractory ceramic. The burner mixes fuel and air which are ignited at the tip, which protrudes a short way into the chamber lining. The air pressure, and therefore heat, can be increased with a mechanical blower or by taking advantage of the Venturi effect. The workpiece, say a wrench, is created by hammering a piece of hot metal into an appropriately shaped die. The metal (in an easily produced shape like a rod or brick) is heated and placed on the bottom part of a die. The top part of the die then drops onto the piece, which gives the forge its name. The die may drop under gravity or be powered, but in all cases drop forging involves impact. The force of the impact causes the heated metal to flow into the shape of the die, with some metal squirting out of the thin seams between the dies. This thin metal is called "flash" and is cut away in the next stage of processing. The drop-forged pieces usually need further processing, like machining and polishing of working surfaces, to provide tighter tolerances than forging alone can provide, and to produce a good finish. In hydraulic press forging the work piece is pressed between the two die halves with gradually increasing force, over a period of a few seconds. The quality of the pieces is better than drop forging as there is more control over metal flow, but takes longer and requires more energy. It also makes the same shape continuously. Iron tapped from the blast furnace is pig iron, and contains significant amounts of carbon and silicon. To produce malleable wrought iron, it needs to undergo a further process. In the early modern period, this was carried out in a finery forge. There were several types of finery forges. The dominant type in Sweden was the German forge, which had a single hearth that was used for all processes. In Uppland north of Stockholm and certain adjacent provinces, another kind known as the Walloon forge was used, mainly for the production of a particularly pure kind of iron known as Öregrund iron, which was exported to England to make blister steel. Its purity depended on the use of ore from the Dannemora mine. The Walloon forge was virtually the only kind used in Great Britain. This had two kinds of hearth, the finery and the chafery. In the finery, the finer remelted pig iron so as to oxidize the carbon (and silicon). This produced a lump of iron (with some slag) known as a bloom. This was consolidated using a water-powered hammer (see trip hammer) and returned to the finery. The next stages were undertaken by the hammerman. His work was to draw the bloom out into a bar to produce what was known as bar iron. In the course of doing so, he had to reheat the iron, for which he used the chafery. The fuel in the finery had to be charcoal, because impurities in any mineral fuel would affect the quality of the iron. This is an obsolete process of making iron. The finery forge process began to be replaced from the late eighteenth century by others, of which puddling was the most successful. These used mineral fuel (coal or coke), and freed the iron industry from its dependence on the speed of growth of trees. That transition is the industrial revolution for the iron industry. A solar forge is a device that uses the power of the sun to melt materials, such as asphalt. A large Fresnel lens, usually rectangular and several feet long on each side, is positioned as a lid of a hollow standing cylinder. The lens focuses the sun's radiation to a point inside the cylinder, where the material to be melted is placed. The effect is the same as a magnifying glass used to burn a dry leaf, except that the heat achieved is much greater. Solar forges work best in desert areas where there is plenty of sunlight. They are dangerous to approach because of the great heat and light generated. A safe way to handle the danger is to cover the lens when not in use. Solar forges are easy to build, because they consist of only two parts. Other optional parts are: a cover, a pollution-control device (for the smoke), a vent, a temperature gauge, protective fire-proof clothing, and gas masks. Solar forges have the benefit of cheap construction and no fuel cost, unlike other forges. However, they cannot achieve the higher temperatures that other forges can. They are good for melting materials with low melting points. Ares, Jose Antonio (2006). Metal: Forming, Forging, and Soldering Techniques. Hauppauge NY: Barron's Educational Series. ISBN 0764158961. Koth, A. and Heinz Tschaetsch, (2006). Metal Forming Practise: Processes - Machines - Tools. New York, NY: Springer. ISBN 3540332162. This page was last modified on 19 April 2017, at 15:31.